Hello ! First of all I have no idea is their a request for how many post , experience on the server but I did play on the old BeastStory which I was iUnknown . So have fun reading this LOL . I would As a GM, I would satisfy and resolve the issues from all players in need. Many people in the game are pretty slick being that they would set their cheat engine to a max damage of 1,999,999,999, etc. so they can prevent reaching the damage cap. I will endeavor banning all those that try to get away with hacking and duping. I will help all newcomers to the game because I know it’s quite hard to level up and begin rebirthing since everything is a bit expensive but that’s preferably already taken care of because I know many people and I give assist to those that are in need. I will host events daily so members of BeastStory will have an opportunity to achieve specal prizes. Besides the community and the entity of BeastStory, the dialect spoken in game has to be mellow, also known as being mature. 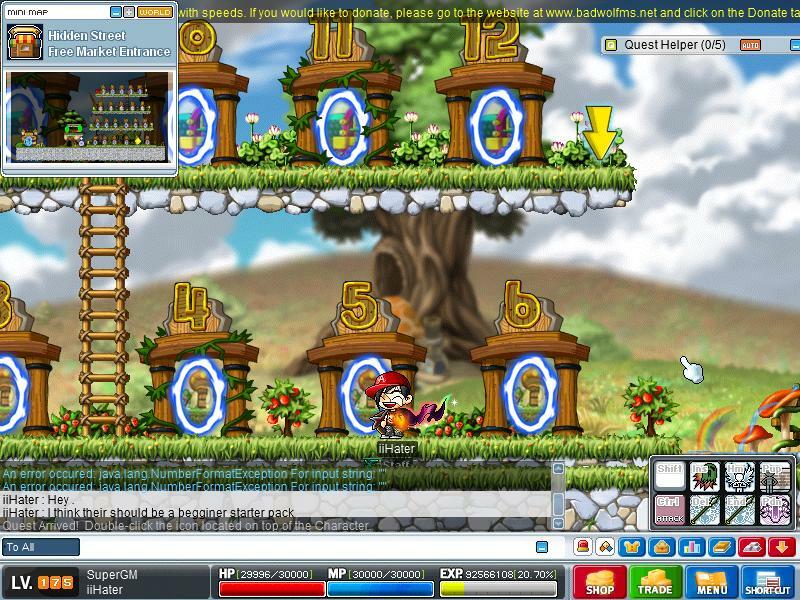 Maplestory is a game for members in it to have a vast amount of fun and amusement. It isn't for members to bane on others or cuss here and there. I'm pretty sure everyone cusses because they just can't help themselves but it has to be reduced and declined. My doings would be to cease the conflicts and bizzare activities that go on during the game to prevent further conflicts. My personality would have to be what makes me really stand out. I’m not boisterous but I’m quite amusing, fun and loving to be with. Besides that, I’m rarely ever in a bad mood unless I’m stressing over something or someone or something pissed me off to a point where I can’t even manage my own anger. I am really straight forward with most matters because I like to keep things simple and manageable. Besides my personality, I can speak several languages to which I’m able to help people of different races. I’m able to speak fluent Chinese, English, Hainanese, some Spanish, and some Korean. I’m pretty perspicacious if I shouldn’t say so myself. I’m really observant to what’s going on around. I’m not going to talk boastingly but I’ve got to say that I’m quite ingenious and I have a cognition to just write dissertating about bountiful circumstances. I'm quite acquaint to everyone around me and that's probably how I tend to make many new friends anywhere. To accumulate your talents and skills and express them to others can really bring out a change. It definitely is what makes you truly stand out. My reasons for wanting to be a GM are clear and simple. Through my moments in the old BeastStory and now , I’ve seen many in need of assistance and help. I would love nothing more than to aid and regulate those that are in need of it. I will be there not only to replace the absence of the CoOwners and GMs that are offline but to do my job as is. I want to ameliorate the game play so everyone is satisfied as they are playing in BeastStory. Hackers on the other hand are an intricacy problem during game play. It’s unfair to others as they’re training through hours and some people hack their way up to level 200 and begin rebirthing. Besides that, there are many people that are beginning to dupe items by packet editing. Something has to be discharged and I’m willing to make an effect to help the community of BeastStory and all the members in it. Yes I would still play since Ive been playing this server for quite along time and even if I do get denied its not a big deal because the reason why MapleStory was created was for people to play, make friends, have fun and thats it , its not a game which it is your life and yeah , and passed so long Ive met alot of friends which I will continue to play util it shut downs ( Hopefully Not ) . Also , even if you do get denied it dosent matter as long as you are a part of the community of BeastStory . Other servers were MyMaple (v62) Heard it was still growing now and other server I cant remember. Erm , I dont have one right now but ill try to get one soon. I added extra info because Devil gave me a tip to. What commands you will mainly use as a Gm? Gm commands are a keen utility to ordain the community of the Private Server so I definitely will not abuse the powers that are given to me. I will use them wisely as I will not use them intemperately to cause any disorderly effects to any members or characteristics on BeastMs. !ban – If a member of BeastMS is hacking, duping, or advertising other private servers on this server, they will be banned. (Screen shot will be provided if the person was to appeal their ban). !cheaters – I will use this daily to see any suspicions of hackers, cheaters, etc. !event – I will use this command to host an event if permitted to do so. !jail – If warned a particular amount of times, will jail if the person is not comprehending with the directions. !say – If there was any notice that I needed everyone to know, this would be the command I would use. Thanks very much , took me like an hour and thirty mins to do this . Man,, nobody has pictures of themselves.. always the excuses. But otherwise, i like it. Very impresseive. But im not sure if that will make you a GM. Everyone says the same things usually. "Early bird gets the worm." I might accept. Looks like your very serious about this job. But i want you to do more than just ban players for hacking and etc etc. I want you to host a lot of events when owners or head gms are not here. But i didnt say your a GM yet. Yeah I know but when I tried to edit again to check if theirs any errors it said I couldnt edit anymore times . I know this app is good and all, but i need a person that has been on BeastStory since they came here. No slacks because it looses attention from the players and your reputation will go down. And when your reputation goes down, people dont think you as all of the biggy person. And when your not the "biggy" kinda person, you dont get listened to and it wont help the server. Seems like if you slacked playing long ago, your probably gonna do it again. All in all, i would accept you if you stayed here. Lets try again later when APPs are back open. Hopefully, that made sense. Ethan , I didnt get what you were saying . not being active or involved with the community, as much. Im not full active because I have school + After school I do homework not like people with no life going on after they leave school . I still have a life you know, Im not going to fail High School to University. So it depends on if im busy or not.